Enjoy being Active Together - Play Family Capoeira! Family Capoeira is an adult & child class enjoyed together by a grown-up (parent, aunt, granny, uncle, nanny...) and children aged 3 and above, where adults and children actively explore the art of Capoeira together through movement, rhythm, music, and social interaction. Family Capoeira is a fun way to be active with your child, be part of a friendly and local community, and become part of a rich and diverse culture which enriches our lives now as well as it did in the past. 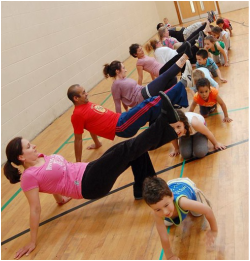 These classes are also an opportunity for busy parents to combine a mini workout with a quality time with their children without worrying and paying for the childcare. Physical ability – coordination, strengths, over all fitness, balance, agility, flexibility, endurance, and speed. Mental ability – memory, game tactics, observance, goal-setting, confidence, perseverance, sense of achievement. Social skills – team work, respect, tradition, cultural and social cooperation, expression, leadership, sense of belonging. 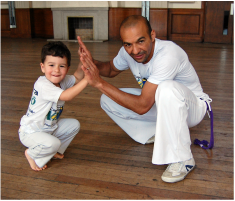 The instructors and carer role-models in Capoeira teach kids valuable life lessons and habits that can lead to a lifetime of good health and civic involvement. Surprisingly to many parents after a few classes often it is their kids who get to be the teachers by showing their parents how to do certain moves. And they absolutely love it! Ultimately it is about having fun while being active with your children. The whole family will learn many new skills and have a quality time together! Capoeira is a rich and diverse art form originating in Brazil around 16th Century. It is generally accepted that Capoeira was created by slaves as a way to practice self-defense skills to escape from captivity of their masters and to defend their freedom later on. With no free time and always under the vigilant eye of their masters these slaves could not practice such skills freely, and Capoeira was born as an art form, as a cultural ritual, as a dance and a game, where self-defense movements are disguised in a dance like movements, where music and songs are as important as the movement itself. Capoeira stories tell about rich history of the lives people led before, their suffering, happiness, friendships, quests for freedom, the joy of companionship and beauty of Capoeira; they teach valuable lessons to us all and encourage to live in a moment, to learn, to be happy, enjoy what we have while always striving to improve. Cobra Capoeira is a Capoeira School in Berkshire established in 2010 by Raimundo (aka Contramestre Cobra) with the aim to make Capoeira available to all children and adults in Berkshire and near by; offering benefits Capoeira brings to individuals and local communities. Raimundo, from Brazil, started Capoeira as a teenager and now has more than 20+ years of experience in teaching and practicing Capoeira around the world. Our classes are fun, interactive and educational and are already enjoyed by many children and adults in Berkshire. Capoeira project at your school? To arrange a Family or Kids Capoeira Project at your school as after school club or part of school curriculum please contact us. You can download Family Capoeira information leaflet for your information. We also specialise in providing informative or entertaining Capoeira shows, displays and workshops for schools, local organisations, charities and corporations. Book us now!